Call it an explosion of cute names for a cause. Announced this week, CryptoKitties debuted a number of new initiatives that will further decentralize its popular ethereum app, which while largely passing under the radar, show the startup is making strides to give users rights. It’s been the subject of criticism for the beloved game, which raised $12 million in March with the expectation it would loosen controls on its code in line with the larger crypto ethos. Among a slew of updates, CryptoKitties is open-sourcing its API and smart contracts for gameplay in the KittyVerse – a virtual world of experiences including catfights, racing and accessories – through a developer toolkit. Plus, it’s updated its user agreements to be more lenient and introduced a players’ rights contract called the Nifty License. And CryptoKitties isn’t just improving for end-users, but also for developers. Take players like Candi Johnson, who have donated their time to build gameplay features like more complex battle options. Observers pointed out that CryptoKitties’ old terms of service stipulated the team owned all graphics and elements of the app, but the Nifty License gives Johnson, and other cat owners, the legal rights to the intellectual property of each tabby. A traditional, centralized gaming studio might balk at the idea of letting users take their digital assets off the platform. To the contrary, CryptoKitties co-founder Bryce Bladon said that diverse experiences with the items increase the whole ecosystem’s value, plus, people looking to build alternative versions of CryptoKitties now don’t ever need to worry about being sued. 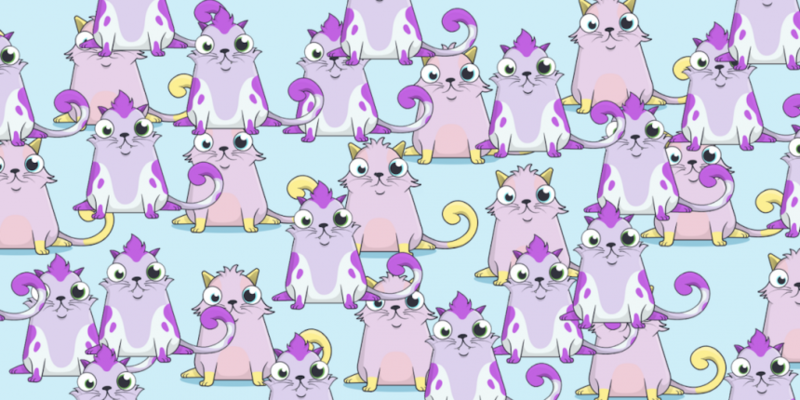 Looking ahead, CryptoKitties plans to build on this progress by looking into decentralized data storage solutions like Filecoin and the InterPlanetary File System (IPFS), Bladon said. Crypto collectibles are valuable only as long as they are unique or rare – so balancing owners’ rights with some limitation on how these tokens are reproduced will be crucial to this ecosystem’s success. Bladon said he hopes the Nifty License can set an example for other non-fungible tokens, a broader class of crypto assets of which CryptoKitties is the most well-known, establishing a norm where the asset belongs to the user and not the platform. “That is why we have loosened up our terms of service. That is why we put this license out there,” he said. However, the Nifty License still appears to stipulate that owners can’t apply the cat’s image for commercial use – like a company logo – or sell it on a marketplace that doesn’t verify ownership, such as Craigslist. Limitations aside, Parity’s Schoedon sees the Nifty License as a step in the right direction. “It would be good to just get away from this second-layer licensing issue by just saying ‘whoever owns that token owns the attached art,'” he said, referencing how commercial use and distribution clauses can get tricky. Fortunately for gamers, the CryptoKitties team sees the Nifty License as a work in progress. Looking ahead, the virtual playground will no longer be maintained solely by the startup. Case in point, Johnson’s work on new CryptoKitties’ experiences is not as a part of another open-source project or separate IP; instead, it’s just for the love of the game. “The goal is to add value to the community and the kitties by giving them additional functionality. They’re super cute as collectibles, and being able to play with them is fun,” Johnson told CoinDesk. Yet another initiative CryptoKitties announced this week is the Nifty Kitty Program, which gives opportunities for independent developer teams to apply for loans or grants to fund work for the community. “We are trying to build sustainable revenue options for people outside of the core CryptoKitties team,” Bladon said. These days, the startup’s main source of revenue is charging 3.75 percent on all transactions done through CryptoKitties.co, such as buying a new kitty. However, since the ethereum smart contract is open-source, other parties could theoretically give birth to new pets without that tax. Bladon said users with the skills to utilize the smart contract themselves have always been welcome to experiment. The team has already selected a few external projects to receive loans or grants through the Nifty Kitty Program. Whatever those teams make won’t be owned or managed by the original startup. This initiative aims to boost outside participation in building a cat-tastic ecosystem. For Johnson, CryptoKitties was her first introduction to blockchain technology and she enjoyed the opportunity to learn more about it with a group of players who call themselves the KittyBattles team. Regardless of whether this team ever seeks monetary rewards for their creation, other developer teams might want that option. The Nifty Kitty Program could be aligned with CryptoKitties’ interest in decentralizing its processes. In the future, if CryptoKitties relinquishes control of the platform, the game would still need a vibrant developer community to continue iterating on the game to make it fun for users.